LOOKING AT PRE–NEW YORK Piet Mondrian, I could only think about the reductive zeal and restraint that must have been required to focus on the spatiality of the white voids, which seem at once to seek out and reject color. 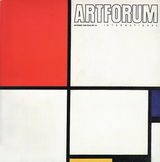 For Mondrian, the diamond-shaped canvases of the ’20s and the asymmetrical spaces of plastic structures compose an ascetic music. Veiling and distorting the codes that signal a direct correspondence between what is represented on the picture plane and an external object, Mondrian attempted to achieve a visual approximation of the dialectic between the spiritual and the natural.